Talamanca Range-La Amistad Reserves/ La Amistad National Park is a mountain range that contains the highest peaks in Costa Rica and Panama. The range is of global importance as it is a centre of endemism for many plant and animal groups and as an important habitat for many large mammals (Baird's Tapir, Puma, Jaguar) and birds that are now threatened in much of their range. This conservation area doesn´t only include La Amistad International Peace Park, but also a myriad of other protected zones, such as Tapantí-Macizo de la Muerte National Park, Chirripó National Park, Barbilla National Park,Hitoy-Cerere Wildlife Refuge, Las Tablas Conservation Area, Río Macho forest area and several indigenous reserves, on both the caribbean and the pacific sides of the Talamanca mountain range in Costa Rica. As it becomes apparent this areas are spread all over that mountain range in the costarican side of the border and are a great percentage of our territory. They range over a diference of 3.000 meters from the rainforest and marshy lowlands on the caribbean to the high peaks in the range, that include most of Costa Rica´s highest peaks, including the Chirripó (over 3.800 meters o.s.l), Kamuk and Cerro de la Muerte, all them which in the ice ages were covered with glaciars and today still show the action of the icefields. I personally recommend as a costarrican the Chirripo National Park, since I visited it some years ago. It is so different to what tourists are accostummed to visit in Costa Rica (beaches and rainforest) that it drives completely another kind of adventure and spirit to it. It´s a really spiritual place, the low temperatures, the difficult trails, the rocky landscapes and extremely pristine lakes and rivers, the ghostly forests, the winds, the fog, the view atop of Chirripo mount of both seas, and a great part of the country, the impressive sunshines and sunsets, the moles of the Crestones rocks overlooking the high mountain valleys...it´s a hard and phisically demanding adventure but also a moving and spiritual one. Just to finish, I have to say that the accomodations inside the park are excelent and you get there after a 15 kms walk in which you see all the habitats from 1300 m to 3400 m, to the side of San Gerardo de Rivas, Perez Zeledon county. In February, I was in Panama City for a meeting and decided to make it to Amistad. First there is a 6.30am flight from Panama City to David in Chiriqui province. 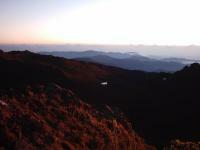 I was picked up by a guide at 7.30am in David and travelled another hour passed Cerro Punta to get to the park entrance. The scenery along the way were all cattle farms and agriculture. Very lush as we are now up to 6000 feet. In the park there was a small park HQ where you registered and paid a small fee. Then there were several trails to take in the forest. I took the El Retorno trail hoping to see the Quetzal bird. No luck on the bird and after a couple of hours we were done. I was planning on staying the night in David but decided that there was nothing to do there and forfeited my room to fly back to Panama City on the 5pm flight. If you have seen tropical forest before, you can definitely skip this one. Parque La Amistad has also been called a peace park by Dr. Oscar Arias, past president of Costa Rica and Nobel Peace Prize winner. As a peace park it has functions beyond conservation or preservation. By presidential declaration (both Costa Rica and Panama) it is dedicated to serving as a working example of peace between neighboring countries and also to fostering sustainable development in buffer zones of the park. The east and west entrances to the park are radically differnt from one another. The park is a treasure. Orchids: Only in the La Amistad National Park this source indicates more than 500 identified species (see Link). Situated on a Continental Divide: The International Park is situated generally across the cordillera which constitutes the Continental Divide and, e.g the Costa Rican portion includes the "Caribbean La Amistad and Pacific La Amistad Conservation Areas". Territorial Highest points: The Costa Rican sector includes Cerro Chirripo "The highest point in Southern Central America" (AB evaluation) at 3820 metres and thus also the highest point in Costa Rica. The original nomination also included the highest point in Panama :- Volcan Baru at 3470M metres (from which it is possible to view both Pacific and Caribbean) but IUCN/WHC required Panama to exclude it for "lack of integrity"
Natural sites with indigenous human population: Approximately 10000 Bribri, Cabecar, Brunca and Guaymi live within the park (AB Ev). Foreigner prices: •	La Amistad National Park: Residents: ₡800; Non-residents: $10 (₡5.638 at today's exchange rate). •	Chirripó National Park: Residents: ₡4.000 (not including transportation San Gerardo-Crestones base), Non-residents: $18 (₡10.148 at today's exchange rate, not including transportation San Gerardo-Crestones base). 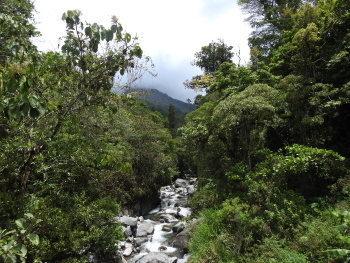 •	Tapantí-Macizo de la Muerte National Park: Residents: ₡800; Non-residents: $10 (₡5.630 at today's exchange rate). •	Barbilla National Park: Residents: ₡1.000; Non-residents: $5 (₡2.819 at today's exchange rate). •	Hitoy Cerere Biological Reserve: Residents: ₡1.000; Non-residents: $10 (₡5.630 at today's exchange rate). 37 Community Members have visited.